Next week's Rock Band 3 launch marks a giant step for the franchise, with the pro mode edging its gameplay closer to actual musicianship. The keyboards and drums are easier transitions to make, given what's essentially one-to-one mapping for notes and logical input solutions. But what about a guitar, arguably the genre's flagship instrument? We've seen and tried two solutions to the pro guitar input conundrum: the Squier Stratocaster, an actual guitar that's still not ready for primetime, and the Mad Catz Fender Mustang, a 102-button replica more reminiscent of peripheral than instrument. Still, with a mid-November release date, the latter's likely to be your only official option for pro guitar rocking this holiday. So, how does it fare? Read on to find out! P.S. For all your other Rock Band 3 queries, check out Joystiq's exhaustive review! 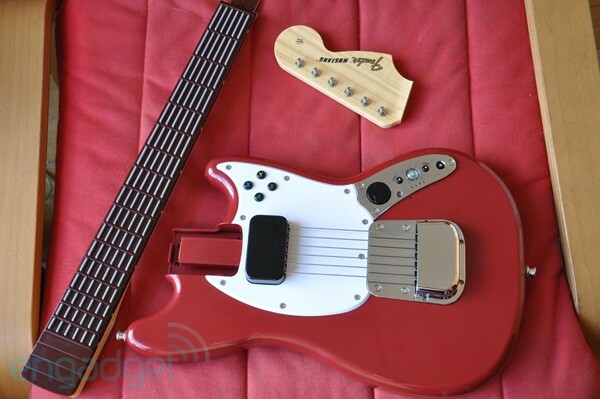 The controller itself resembles the Fender surf body popular among the real-life Mustang (of course) and the Jaguar guitars. The peripheral's much lighter than a real guitar, but fortunately the neck is pretty much the same height and width as our personal Stratocaster. 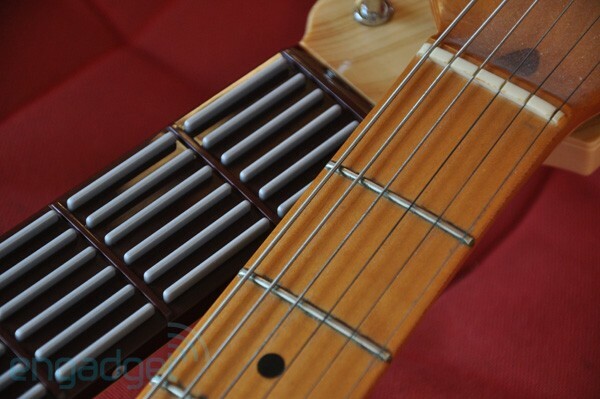 Each fret and each string is represented by a vertical button, all with height representative of the actual fret but all of equal width (more on that later). At 17 frets, that adds up to over 100 buttons -- quite a few for gamers used to just five. Buttons aren't limited to just those frets, of course. The pickguard boasts the typical gamepad face buttons and there's a directional pad below, as well as a guide button, start and back / select buttons, sync, and the necessary mic / camera for automatic calibration. There's also the MIDI-out port -- if you have a synth handy, you can play a MIDI track -- and as far as plucking is concerned, there are six identical heavy-gauge strings on the body. They're long enough to easily find mid-song, though they might be a pain if you're used to playing closer to the neck. The overall construction -- which can be broken down into its constituent head, neck and body components for transport -- feels lightweight and borderline-flimsy at times, though to be fair, it's held up remarkably well during our time with it and we don't have any reason to suspect it might do otherwise. We've gone into thorough detail about how pro guitar works on the software side of Rock Band 3, for better and for worse (you can check out that impressions piece here), so for this review we're largely going to focus on how the hardware feels. And, as we've alluded to before, it's kind of a hassle if you're coming at it from an actual guitar. Given the varying width of real guitar strings, it's much easier to tell what frets we're pressing (and which strings we're finger-picking) on a real instrument without having to look down. Here, every string and button is a uniform width, so everything feels the same against your skin. We could certainly get used it over time, as it's more of a nuisance than anything, but it's definitely increases the learning curve and detracts from enjoying the instrument. One other annoyance that we noticed is the overall sensitivity of the buttons -- it doesn't take much to actuate them, even when you don't mean to. Light touches, such as resting your finger against an unused string, can trigger a note that'd otherwise be considered a mute. Perhaps we're nitpicking here by comparing the Fender Pro to a real guitar, but our points stand: coming from real instrumentation, there are definitely some adjustments you'll probably need to make, else succumb to missed-note frustration. We'd be lying if we said our opinion of the Mustang wasn't tainted by our previous time with the "real" Squier Stratocaster pro guitar, which felt infinitely more comfortable even in prototype form. That may be a bit unfair, and honestly, our Joystiq cohorts had a much more positive experience. Plenty of people are going to love this rig, but at $150, we feel it's our duty to warn you about even these nitpicks before you shell out. While some of Mad Catz' design decisions made for a tedious experience at first, they never truly detracted from our overall enjoyment of the game -- or to put it another way, when the going got tough and we swore like a sailor, it wasn't the controller we were blaming.